ESRI UC, the largest conference for GIS users, developers, integrators and suppliers will take place at the San Diego Convention Center in San Diego, California USA from July 13 to July 17 2009. The conference registration deadline is May 22, 2009. Preconference seminars, trainings and special events (for registered attendees only) are scheduled on these general topics: Developer, Enterprise GIS, Fundamentals, Industry Focus, Mobile GIS, Server and Technology. 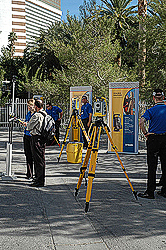 For industry-specific questions, go to the list of ESRI Industry Team members . For general conference questions, go to the email address below. ESRI develops Geographic Information System and mapping software. It is an international company headquartered in Southern California.